Aluminum vs. Aluminium – What’s the Difference? Home » Aluminum vs. Aluminium – What’s the Difference? The periodic table has a name for every element, and English has at least one word that corresponds to each name. In the case of the element with the symbol Al and the chemical number 13, English has two words: aluminum and aluminium. The difference between these two words comes down to the differences between American and British English. While aluminum is the original word, British editors standardize around aluminium, to preserve consistency with elements like sodium, lithium, and titanium. Still, there are some contexts where aluminum is a better fit. Continue reading to find out when to use each version of this word. What is the Difference Between Aluminum and Aluminium? In this article, I will explore the aluminum vs. aluminium debate. I will use the words in example sentences to illustrate how they should look in context. I will subsequently show you a mnemonic device for your mental toolkit that will help you remember whether to use aluminum or aluminium. What does aluminum mean? The word aluminum is a noun. Aluminum is a type of metal that is useful in a variety of applications because it is lightweight, resistant to corrosion, and excellent at conducting heat. Aluminum conducts electricity but not as well as silver, copper, or gold. Kyle used aluminum baseball bats when he was young, but as he grew older, he switched to bats hewn of ash. My cookware has a layer of aluminum bonded between layers of stainless steel, so that food heats more evenly. Even though this chart isn’t scientific or exactingly accurate, it can still illustrate a long-term usage trend. “Bloody hell, Commerford, stop using that silly Italian pot; the coffee tastes like aluminium!” said Wilshire. “Is the tap made of aluminium, or stainless steel?” asked Bronwyn. You can easily decide whether to choose aluminum or aluminium by keeping your audience in mind. American readers are used to aluminum, while British audiences prefer aluminium. It’s worth noting that aluminum was the original form, so for especially strict scientific purposes, you might want to choose aluminum regardless of audience. If you have trouble remembering that aluminium is the British version of this word, remember that aluminium has two I’s, much like the word British. Is it aluminum or aluminium? Aluminum and aluminium both describe an elemental metal that makes up roughly 8% of the earth’s crust, and is used by humans for many things. Aluminum is the American version of the word. Aluminium is the British version. Since aluminium and British are each spelled with two I’s, you can easily remember that aluminium should be reserved for British audiences. If you require additional assistance, be sure to check this article for a quick refresher when choosing aluminium or aluminum. 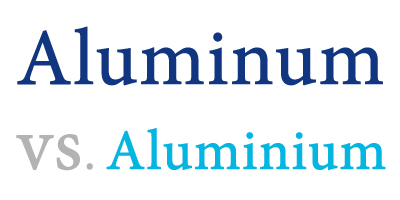 1 What is the Difference Between Aluminum and Aluminium? Acknowledgement vs. Acknowledgment – What’s the Difference? Burst vs. Bursted – Is Bursted a Word?